My friendly, professional, home based, one to one dog training is based on a lifetime of being around dogs and studying their behaviour. Our customers are very pleased with the training services we provide. Contact AB Dog Training today to get the solutions you require. "Alan's just gone; I can't believe the change in bobby. He's calm, relaxed and he's asleep in his bed. Normally he would be on the go all day following me everywhere. I've just been upstairs all by myself for the first time since I got him. I found it easy the way Alan teaches you and you see results fast. I and bobby are on the right path now all thanks to Alan." "Alan was fantastic; he was my last hope for turning buster around. I saw a change in buster within an hour and even though it isn't going to happen overnight he gave me the tools to work with. 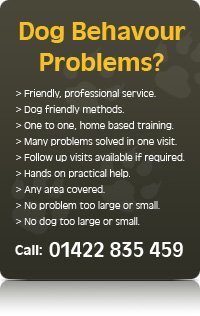 I would definitely recommend him to anyone with problems with their dog. Thank you again Alan." "Thank you very much for a brilliant day on Saturday. He is already a different dog. On meeting lots of other dogs his manners were impeccable. Walking him is a real pleasure. Things have improved so much, so quickly that it feels like magic. I would recommend you to anyone who has a dog and wants to make its life and their own more relaxed and enjoyable. I am looking forward to the next walk!" "We noticed a huge difference in our dog within a few hours, Alan had him doing things I never thought possible within one hour. I would strongly recommend Alan; we tried three other trainers before Alan and none of them did in months what Alan did in hours. Try him you won't be disappointed." "Absolutely brilliant, I am made up, the fact that 'woody' has gone from the naughtiest dog to a very chilled out, happy boy. "In the 48 hours since you visited, the change in my dogs has been incredible!" "The best money I ever spent! You totally transformed my dog."